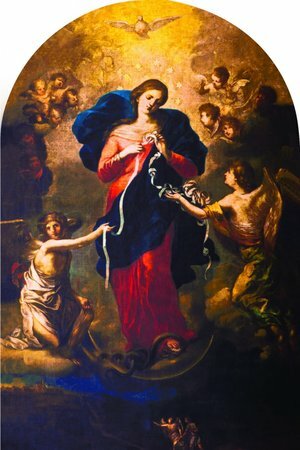 Here’s the Final Prayer of The Our Lady, Undoer of Knots Novena! Thanksgiving post for answered prayers. Our Lady has undone my knot of loneliness. I have met and fallen in love with the most wonderful man. I always told my kids that when they met the right person, it would bring out the best in them. I finally have found “the one”! I pray for continued blessings as we ironically head toward “tying the knot”. Thank you blessed mother for the prayers answered. I have been looking for a new job since 9/2016. The day after the novena, I got an offer I was able to accept! Thank you Lord Jesus! Glory to your name, come Holy Spirit!!!!! I sing praises to Mary the greatest intercessor of all! I prayed the Knots novena. My youngest daughter wanted to be Godmother to her niece. However, she is not a practicing Catholic. I have prayed earnestly to St. Monica, St. Augustine and St. Ambrose for intercession. My oldest daughter, a practicing Catholic, did not ask her because my youngest is buddhist. They have never been in the greatest of terms but my youngest recently found out that she would never be able to bear a child. So, the desire to be Godmother grew ever more fervently. I prayed this Novena and the day after it ended. My oldest asked my youngest to be Godmother! my youngest agreed to make her way back to the Church! Mary most Holy. Thank you for your intercession. Thank u Jesus! Dear Mary Undoer of Knots! You did it! Thank you for hearing my prayer. You rock. Thank you for the immense blessing and reparation in our family. Thank you Anne & John Paul for including this novena Mary Undoer of Knots in the list of novena prayers. I believe my “knots” in life are being untangled GRADUALLY. –” Mary, The Undoer of Knots Novena please help our family, my husband, my son and myself with good health and particularly for my son to recover from his Chronic Fatigue Syndrome with continuous headaches for which there is no medication found so far and I ask the Lord and Our Lady to find the correct medication for a cure of this debilitating Fatigue and daily headaches to help him continue with is studies at University. We also pray for healing of my painful knees to cure the ‘Minicus Tear in it with artheritis which makes my joints very painful – and I believe with continuous prayers and faith and trust in the Lord that we three (my son, my husband and myself ) will find healing and all our intentions fulfilled. I do feel a sense of peace and ease meant in my soul! !” Thanks to everyone for the prayers.Thank you Lord for all what we have been blessed with by your miraculous powers.” “There is nothing impossible to God.” Praise God. ” Mary, Undoer of Knots Novena please help our family, my husband, my son and myself with good health and particularly for my son to recover from his Chronic Fatigue Syndrome with continuous headaches for which there is no medication found so far and i also pray for healing of my painful knees and my artheritis which makes my joints painful – and I believe with continuous prayers and faith and trust in the Lord that we will find healing and all our intentions fulfilled. Pray for the three of us to Jesus that He grants us his favor to give the three of us good health, His grace to our family and strengthen us all by abundance of love, affection and peace by the holy spirit. –” Mary, The Undoer of Knots Novena please help our family, my husband, my son and myself with good health and for a successful operation for myhusband on 4th June 2018 and particularly for my son to recover from his debilitating Chronic Fatigue Syndrome with continuous headaches for which there is no medication found so far and I ask the Lord and Our Lady to find the correct medication for a cure of this debilitating Fatigue and daily headaches to help him continue with is studies at University. We also pray for healing of my painful knees to cure the ‘Minicus Tear in it with artheritis which makes my joints very painful – and I believe with continuous prayers and faith and trust in the Lord that we three (my son, my husband and myself ) will find healing and all our intentions fulfilled. Mary, Undoer of Knots, pray for me and for the three of us in our family for good health, peace and love within our family at all times. Please Holy Mother please untie the knots for our son who is waiting to hear from a good job that will give him and his girls more financial security and his oldest will get the mental help that she so desperately needs. Also Blessed Mother that the girls mother and her bad choices will stay away from them all permanently!!!!!! Thank you dear Blessed Mother that our granddaughter will start making the right choices to get her life on the right track. Thank you for watching over us Dear Holy Mother and being there for us always. Thank you, Our Lady, Undoer of Knots!….Key’s have been found before there was any chance of them being copied within the hour! Thank you Anne&John Paul for including this novena Mary Undoer of Knots in the list of novena prayers. I believe my “knots” in life are being untangled. I will keep these prayers in my iPad to pray over again. Mary, undo the knots of my broken soul that aches for love I do not have. Guide me to the person with whom I can share my life fully, the man who will love me in mind, body, and spirit. Give me the strength to persevere in a job that is so very challenging right now and to right myself financially. Help me to live with joy in spite of all of the heartache I have known and to love others though I do not feel loved. I pray for my son Nick. I pray for his happiness and ability to find a career that he enjoys and able to make a good living. I pray that he keeps god first in his life and finds friends who love and support him. I pray that we can lead and find the area that will most fulfill him. Please help us be good guides and instructors. Please show us the way. Thank you so much for the gift of Nick and all the blessings you have showered over our family. I know lord with you all things are possible. Please pray for me Mary, Undoer of Knots, for acceptance, a closer and more harmonious relationship with MS and for JD and MS to commit to a serious relationship. Thank you for undoing some of my knots – please continue to help me rid the remaining knots that plague me. I promise Blessed Mary to encourage devotion to you and my beloved saints, St. Jude, St. Anthony and Our Lord Jesus Christ. Thenks lord for everything I know things are going to be better have pray for everything I need in my life . Mary undoer of knots please untie all the knots that is blocking the flow of my finances today Lord I pray for money to meet my financial obligations.. I pray for the safety of my family members .i pray for my husband and my marriage Lord. Mother undoer of knots please release my finances today. Mary please hear my prayers and those of others that have concerns with marriage, partner closing his heart, power struggles, financial burdens and addictions. I pray to you to help guide us to lift our financial burden. And I also pray for those families who have children suffering or are in hospital care. Please Jesus take care of those families and help them find hope. In your name. 41 year marriage husband spiritually and internally deeply troubled thinks getting rid of me his most precious partner will help him. Know he’s wrong he needs the Lord as center of his life. Continue to pray for restoration for his heart to soften and his mind to clear enough from the sin he’s been living in these past years. God is omnipotent and is destroying this evil that has come to us His loving children. Thank you Lord that you are working in my life until the ink is dry I am believing with faith that you will intervene in my husbands current spiritual blindness . To our dearest Lady, Undoer of Knots thank you so much for the answered prayers. I cannot fully explained a well detailed incidents but it’s been answered. Thank you so much, my eldest son is all good he got a new job he needs that I’ve been praying for just today on the last day of my novena. Paid some very important bills. I’ve always longed for my son to remove his piercings and finally happening yes! because his new job doesn’t allow it ? Thank you God! For all the blessings and answered prayers I am in tears of joy! Thank you Mama Mary, thank you for undoing the knots that made us suffer, in Jesus’ name. Amen. Love, Angie? To our dearest Lady, Undoer of Knots thank you so much for the answered prayers. I cannot fully explained a well detailed incidents but it’s been answered. Thank you so much, my eldest son is all good he got a new job he needs that I’ve been praying for just today on the last day of my novena. Paid some very important bills. I’ve always longed for my son to remove his piercings and finally happening yes! because his new job doesn’t allow it ? Thank you God! For all the blessings and answered prayers I am in tears of joy! Thank you Mama Mary, in Jesus’ name. Amen. Angie? Blessed Mother thank you for undoing some of my knots. Give me strength to live a better happier life less sinful and more caring and helpful towards my husband who is doing his best. Help me solve his personal issues. In the name of the father. Amen. Dear mother Mary please I still continue praying for my incoming nursing board examination on June 3and 4..Help me guide me to have a 88% in my examination ..Send me guardian angel to guide me and help me focus and have concentration while studying …32days left but still a lot of reviewer I didn’t yet finish ..Help me to finish it on time .. Lord. God guide me and give me retentive memory and more knowledge …I trust in you ..I love you..Amen ..
Praying for you to suceed in your exam…….may guardian angel be with you……. Praying and knowing Mary will give you what you need. Blessing and good luck ? I will pray too. Say the Novena to St. Joseph of Cupertino. I just learned of this today.